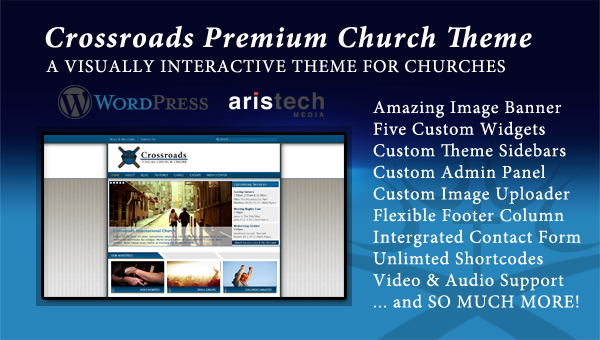 Crossroads is a one of kind church platform. With extensive power and flexibility, Crossroads makes customization a breeze. It is simple to use and has a beautiful design. Built specifically for churches as a platform, Crossroads has a considerable array of features to display upcoming services, contact info, social networks, operation times, and more. All these tools will help you bring your service and information swiftly to anyone who visits or site! Amazing Image Banner Slider (Built Specifically for Crossroads) – jQuery powered with animation – Display nearly an infinite amount of slides – Choose to display in full width or with a Banner Sidebar. IMAGE UPLOAD SYSTEM – Crossroads comes with a custom designed image upload handling system. Uploading new images is fast and simple. 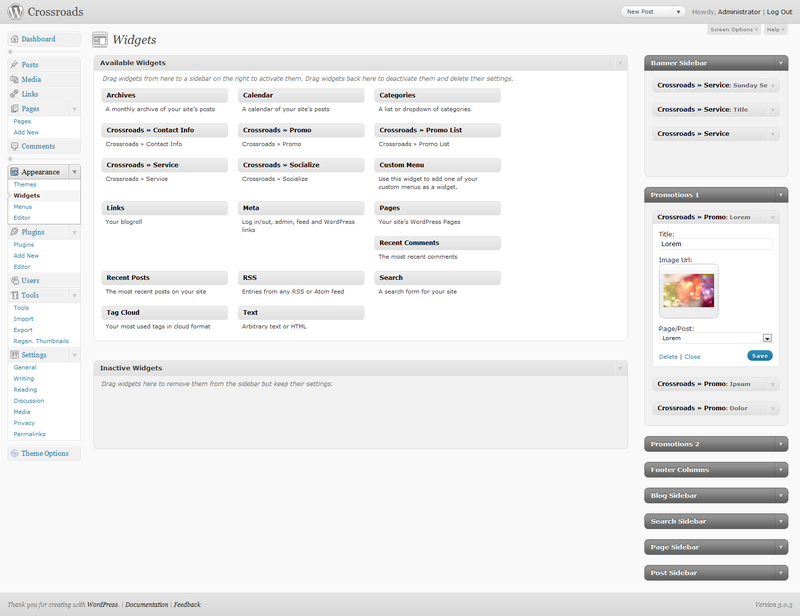 Once images are added to the system, you can re-use it for multiple parts of your theme. With this upload system you can swiftly add or remove images to your theme with ease. General Options – Favicon. – Google Analytics support. Header Options – Support for Maps & Directions link to Google Maps. – Customizable Logo. – Ability to disable logo image or text. 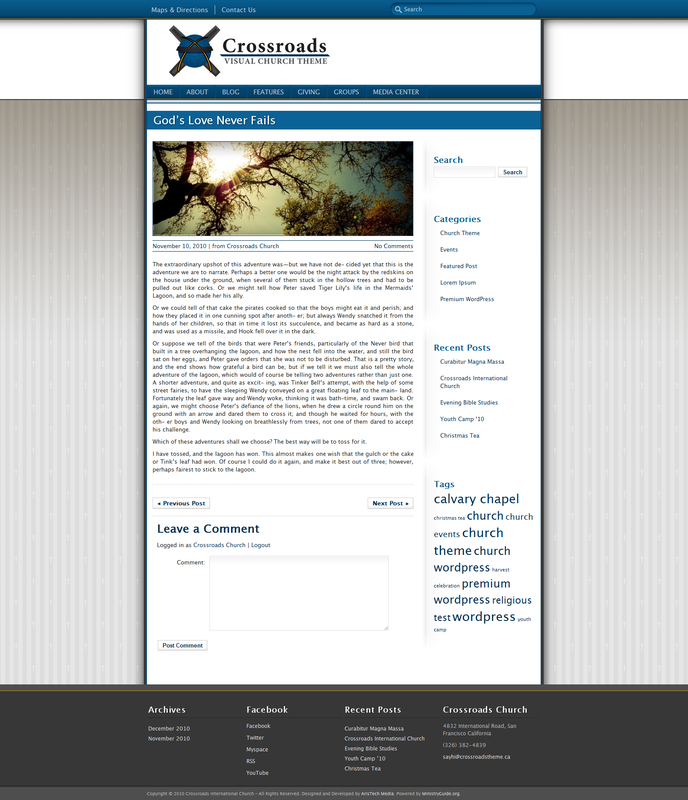 – Change text for the home link in the site navigation bar. – Option to remove home link in the navigation bar. – Easily select any page to be displayed as a link in the navigation bar. Frontpage Options – Banner options including the category to pull from and the limit to the number of slides to display of the category. 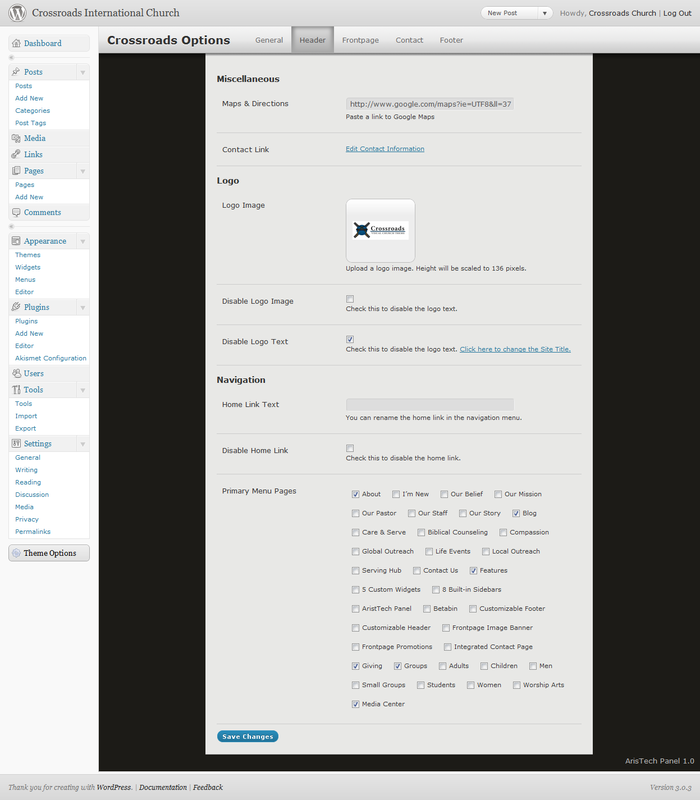 – Optional Banner sidebar settings to be displayed to the right of the Banner. – Completely customizable first and second Promotions areas. 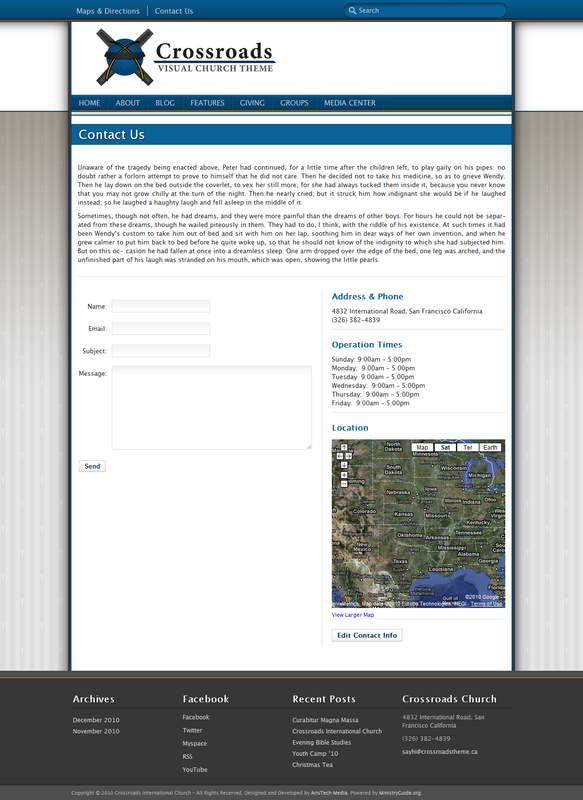 Contact Options – Create a custom contact form to be displayed on the page of your choice. – Display Operation Times/Office Hours – Embedded Google Maps support. 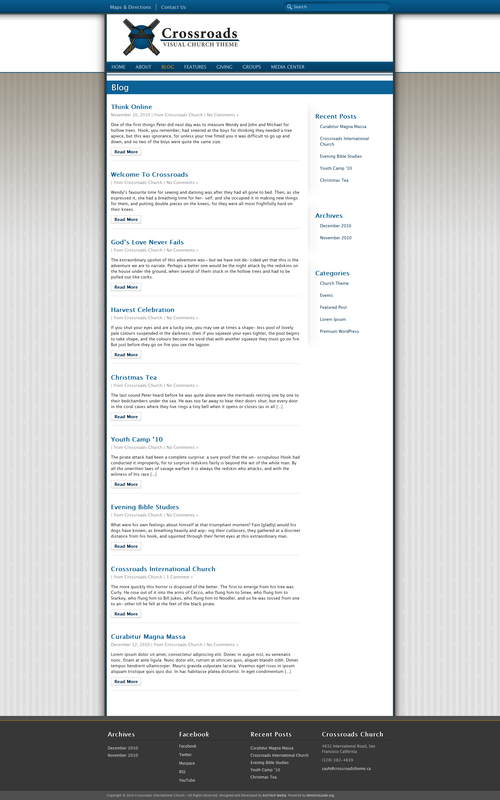 Footer Options – Fully customizable footer columns area. – Support for a secondary link menu. Crossroads » Promo – Image based promotions for your sites front-page. Crossroads » Socialize – Support for popular social networking services (Facebook, Twitter, Myspace). – RSS link integration. – Add an infinite number of custom links to your hearts content! For any and all questions that you may have regarding this theme, please go to support.aristechmedia.com. Thank you!